If you're looking for a textbook example of a steady rise in shares, it doesn't get much better than the current Johnson & Johnson stock run-up. Shares in the blue-chip company are up 15% year-to-date with a nice upward trend. The chart definitely shows a good run for J&J. But could there be a roadblock ahead that will put a damper on these steady gains? There are several factors that could hurt other stocks that shouldn't be an issue for Johnson & Johnson. For example. AbbVie is highly dependent on the success of one drug -- Humira. Although sales for the blockbuster drug continue to experience solid growth, any blip would send AbbVie's shares headed downward. J&J's diversification prevents that type of problem from raising its ugly head. The company's revenue is spread across three large operating segments. Its consumer segment brought in $14.4 billion in sales last year. J&J's pharmaceuticals segment made $25.3 billion, with the biggest-selling drug, Remicade, accounting for only $6.1 billion of that total. The largest business segment, medical devices and diagnostics, generated $27.4 billion in 2012 revenue. Product recalls usually hurt companies. Covidien's shares were temporarily affected by the company's recall of surgical tools last year. Johnson & Johnson stock took a hit in 2010 and early 2011 partially due to recalls of several products. However, the company's latest recall doesn't seem to have fazed the stock. In late March, J&J announced that it was pulling nearly 2 million glucose meters from the market after a patient in Europe died following a faulty blood sugar reading. Shares continued their upward path even after this recall announcement. So what is the most likely impediment to Johnson & Johnson stock success? The answer: Its continued stock success. After a great start to 2013 and a gain of 27% over the last 12 months, some investors could be ready to take some profits. That's more likely as we approach summer. Many still subscribe to the old "sell in May and go away" school of thought. Concerns about the employment outlook and global political uncertainties could also contribute to increased selling. There's also the dividend factor. Thanks to its stock appreciation, J&J's dividend yield currently stands at its lowest point since 2010. Dividend-oriented investors might not be as attracted to the stock as they used to be. The same goes for value investors. 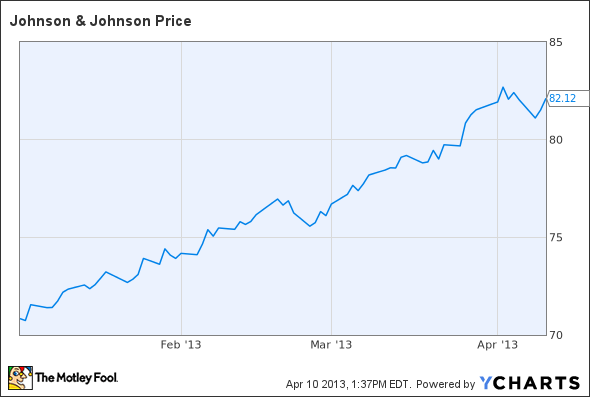 Johnson & Johnson's stock now sports a trailing price-to-earnings multiple of 21. It hasn't been this richly valued since 2006. By comparison, Pfizer , which has a similar-sized market cap, pays a dividend yield higher than Johnson & Johnson. Pfizer shares also trade at a P/E of 15, well below J&J. I wouldn't be surprised to see the Johnson & Johnson stock run halted in the near future. However, I think if it happens, it will be due more to profit-taking and macro events than any problems with the stock itself. And any roadblocks that are encountered should only be temporary, in my view. Johnson & Johnson's stock remains one to hold for the long run. Involved in everything from baby powder to biotech, Johnson & Johnson's critics are convinced that the company is spread way too thin. If you want to know if J&J is nothing but a bloated corporate whale -- or a well-diversified giant that's perfect for your portfolio -- check out The Fool's new premium report outlining the Johnson & Johnson story in terms that any investor can understand. Claim your copy by clicking here now. The article 1 Potential Roadblock for the Johnson & Johnson Stock Run-up originally appeared on Fool.com. Fool contributor Keith Speights has no position in any stocks mentioned. The Motley Fool recommends Covidien and Johnson & Johnson. The Motley Fool owns shares of Johnson & Johnson. Try any of our Foolish newsletter services free for 30 days. We Fools may not all hold the same opinions, but we all believe that considering a diverse range of insights makes us better investors. The Motley Fool has a disclosure policy.